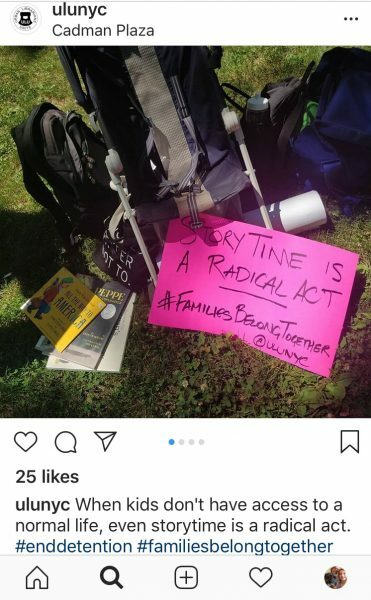 Urban Librarians Unite (ULU) joined thousands of protesters at New York City's Families Belong Together rally and march on Saturday. 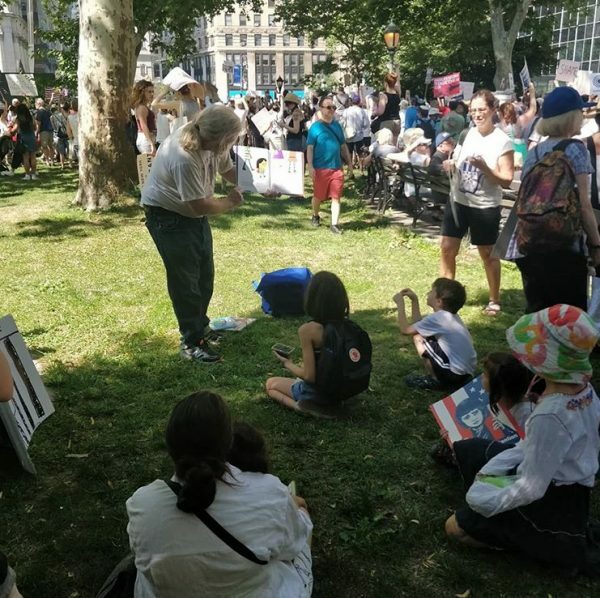 The librarians organized storytime at Foley Square in Manhattan before the march, carried their books across the Brooklyn Bridge and read to children again once they reached the march's destination, Cadman Plaza in Brooklyn. They were there because "everything is wrong and broken," said Lauren Comito of ULU. 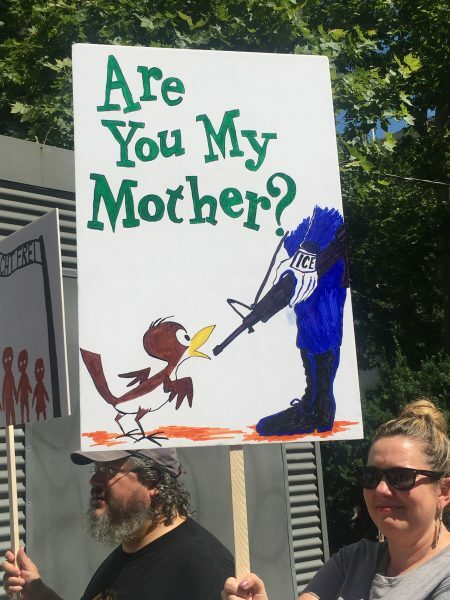 They were there because the children separated from their families and in detention centers across the country should instead be sitting on a parent's lap listening to a story themselves, she said. They were there because being there to support kids is a big part of what librarians do. "Storytime is America at its best,” said Christian Zabriskie, a librarian in Yonkers (NY) and ULU's executive director. “We’re really in the middle of a humanitarian crisis right now and I cannot imagine librarians sitting by the wayside. 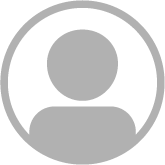 It’s the polar opposite of who we are as a profession. We go into this profession because we choose to care. We choose to be a helper." Christian Zabriskie reads to children in Foley Square. Photo courtesy of ULU. Among the books they read were We Came to America by Faith Ringgold, A Different Pond by Boa Phi, and The Smallest Girl in the Smallest Grade by Justin Roberts. "I feel really strongly about [being at the march], because I am a children’s librarian in the most diverse borough in New York," said Rosemary Kiladitis, who works in Queens (NY). "These kids need every advantage we can give them. We’re there for them and if we’re not going to back up we do in the library by showing them we are always there in times of adversity, that’s a problem." When asked if she has noticed a change in the children who come into the library over the last couple of years, she didn't hesitate. "Gosh, yes," she said. "Kids at my library constantly say 'Donald Trump hates us.' 'Our president hates us.' We tell them that they’re welcome here." 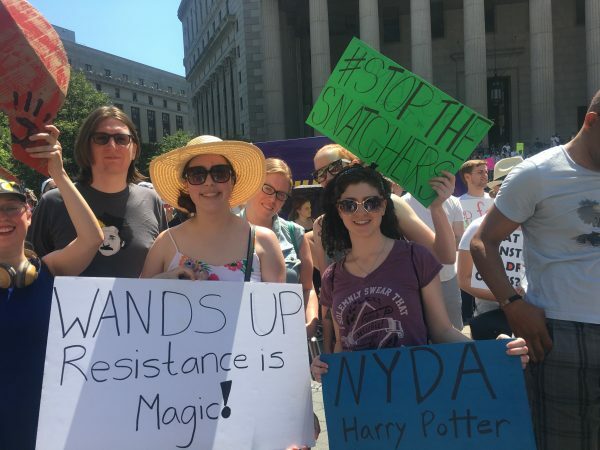 Near the ULU members in the crowd, the New York chapter of the Harry Potter Alliance held signs and continued the advocacy that is at the core of their mission: "making activism accessible through the power of story." "Books inspire empathy," said Marie Vitale, chapter organizer. They also give readers a reference point and feeling like they have been here before and know what to do, even if the book is fiction, she said. "When people recognize situations in books, it’s easier for them to feel like they know how to handle it, they know how to succeed," she said. "The campaign that we’re doing right now is called 'Stop the Snatchers,' which relates to the Snatchers in the 7th book of Harry Potter book, who rounded up Muggles on the run and separated families because of their blood status. So having that example to work from makes it a little more relatable and less scary if you’ve already seen it and you’ve seen it defeated." Members of the New York chapter of the Harry Potter Alliance: Elisa Moore (holding white sign), Marie Vitale (with blue sign), and Marlene Michalek, librarian in the Brooklyn Public Library system (holding the green sign). 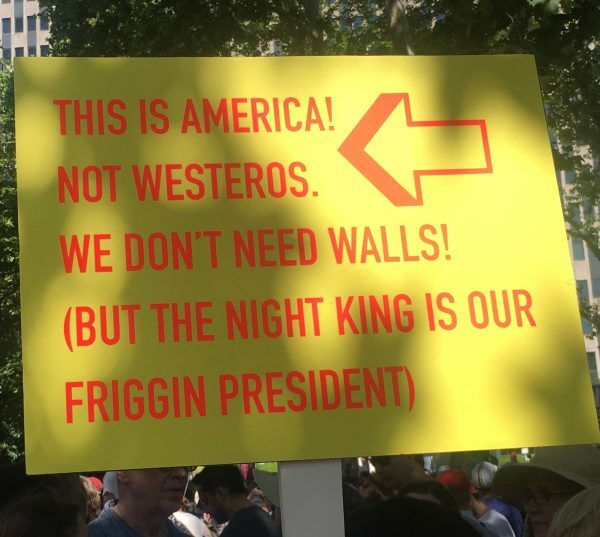 Dumbledore's Army, as they refer to themselves, were not the only ones using literature as their protest reference point. Throughout the crowd, signs referred to books. Could I have a list of those books that were read at that storytime? Thank you.. 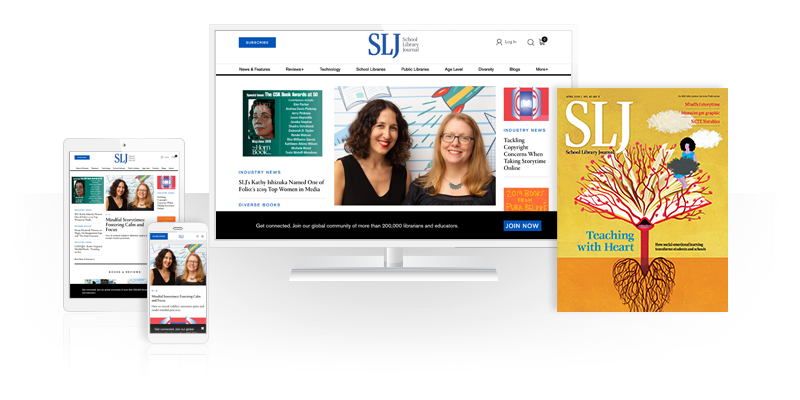 So if some librarians joined up with the next March for Life, would the School Library Journal print a laudatory, lavishly-illustrated article covering it? Or do just ALA-approved causes get that treatment?